Adventure boots are designed in a similar vein to adventure motorcycles, ready to handle the rigors of off-road, yet still be comfortable enough to use day in and day out. Adventure boots are made to be protective, but not as stiff as a motocross boot so that you can comfortably walk around the interesting places you may find along your way. Our list of the best adventure motorcycle boots shows what adventure riders have to choose from with but one click of the mouse. 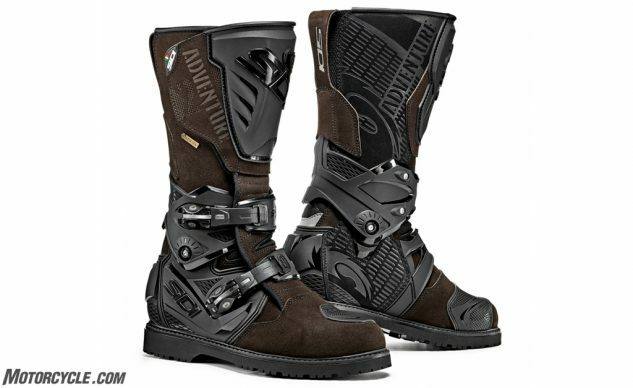 With Alpinestars’ dedication to off-road riding and racing, it’s no surprise to see a well-thought-out technical adventure boot coming from the Italian brand. 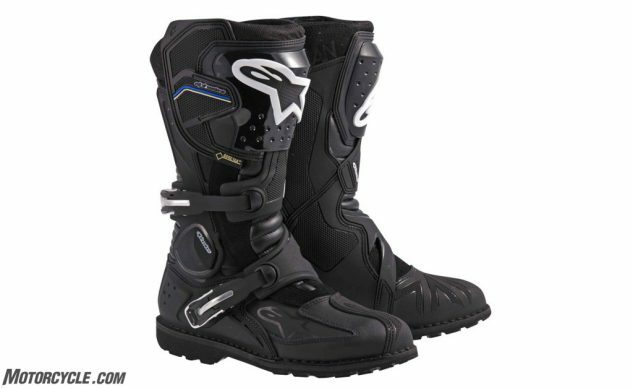 The Alpinestars Toucan Gore-Tex boots are designed to bring off-road protection together with touring comfort and features. The Toucan’s Gore-Tex liner is going to keep you comfortable regardless of what’s going on outside the boot. Windproof for chilly days and waterproof for wet ones. From a protection standpoint, the Toucan features a leather and polymer constructed outer with reinforced TPU protection layers in key impact areas. The heel and toe are reinforced internally and externally while a steel shank adds improved comfort while standing and durability. The lateral ankle protection system provides excellent protection while giving a flexible pivot point for mobility. On the inside of the ankle and leg, the boot has a reinforced polymer with texture to give better feedback from the bike when standing and hugging the bike with your legs. A leather accordion stretch panel is used at the Achilles’ for extra mobility. A large TPU covers the shin for additional protection. Keeping things buttoned up is a large Velcro panel at the top and two ratcheting buckles across the lower shin and over the top of the ankle. The EVA foam footbed is removable should you decide to slip your own insoles in. Overall, the Toucan provides excellent protection and weatherproofing while providing enough flex and comfort to use in any scenario. The Cortech Accelerator XC is an affordable adventure boot that has many of the same features of it’s more expensive classmates. This boot features a water-repellent PU upper with a Nubuck PU inner calf panel for grip. The HiPora waterproof membrane helps to keep your feet dry and comfortable while the pop of reflectivity on the heel gives better visibility. The TecnoGI thermoplastic heel cup and toe cap provide crush protection while the thermoplastic midsole and steel shank give you a sturdy platform to stand on. The molded nylon shin is backed with shock absorbing materials as are the ankles. The three buckle closure with Velcro and an expansion panel at the top helps this boot to fit riders of all (calf) sizes. The Forma Adventure offers the comfort and flexibility of a road-going boot while tapping into off-road styling and design. The Adventure is comprised of a full grain leather upper backed by a Drytex waterproof breathable lining. The injection molded plastic shin plate protects the front of your leg while reinforced internal TPU protection can be found at the heel cup, toe box, and ankle bones. The dual-density sole houses a steel shank in case you find yourself in a prison yard brawl while also pulling double duty to reinforce the bottom of the boot. Velcro and three buckles seal the Adventure up nice and tight. Two things to keep in mind with the Forma Adventure: 1. It is a more flexible boot than some others on this list and will not provide the same protection as some of the beefier options, 2. The waterproof liner goes as high as the middle buckle. With these two things considered, mostly the first, I would say the Forma Adventure is closer to the touring side than it is off-road focused adventure. To quote Forma’s website: Due to the special lightweight sole design, these boots are not recommended for use with kick-start bikes or bikes with aggressive motocross style foot-pegs. 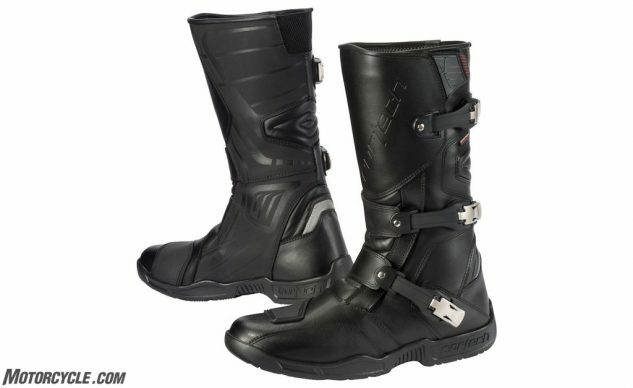 If you are a rider that mostly stands up when you ride, we would recommend the Forma Terra Evo boots for durability. All things considered, you can get the Forma Adventure in black or the nicely-finished oiled brown. G’d up from the feet up. The Gaerne G-Adventure is along the same lines of the aforementioned Forma Adventure; a boot that is geared at touring and adventure touring with light off-roading in mind. The lightweight full grain leather upper is backed by a waterproof membrane while the outer closure is sealed by three buckles and Velcro at the top. The molded shin plates provide protection from shin injuries while the reinforced toe box and heel cup provide protection fore and aft. Unfortunately, there is no extra ankle protection other than what the buckles might offer. A beefy lugged outsole should give excellent traction both on and off the bike. A light ADV boot that’s sure to be comfortable for the long haul. 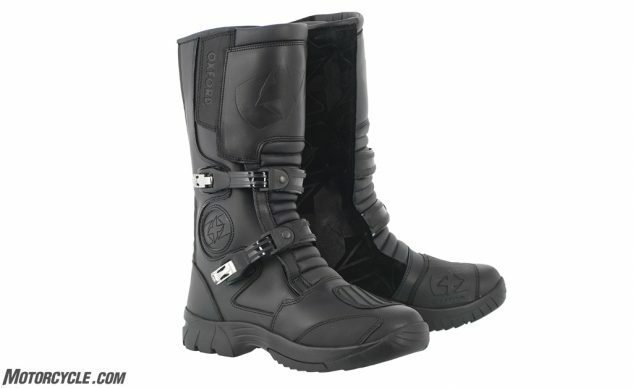 The Oxford Explorer boot comes in at a sweet price to give adventure touring riders a great option at a great price. The Explorer boot is made from a leather upper backed by a waterproof membrane utilizing Velcro as well as two buckles to keep it cinched up. Reinforced ankles, a shanked lower, and beefed up toe box provide a stiff lower section of the boot that should provide decent crush protection as well as protecting against torsional injuries. A well-treaded outsole should provide plenty of grip whilst performing off-bike activities (hopefully not ones involving picking up said bike). Excuse us as we try to shake off the sticker shock. The REV’IT! Expedition H2O are, simply put, expensive. So, what do you get for your 770 greenbacks? Everything REV’IT! saw fit to include in an adventure touring boot without worrying what the boot would have to be priced at, an opportunity designers and engineers don’t often get. The Expedition H2O spent three years in development. 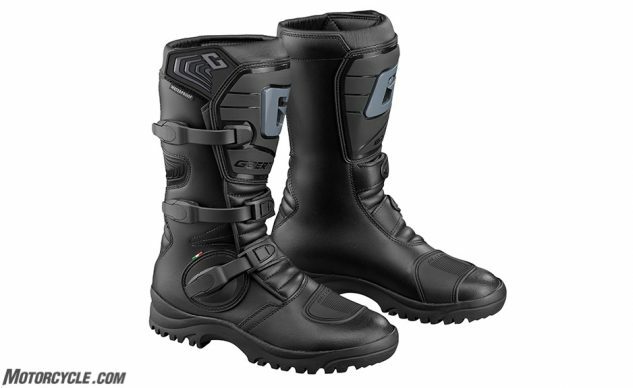 “It combines the protection of MX boots but with waterproofing and unsurpassed comfort on and off of the bike,” says REV’IT! “We hope so,” says us. The Expedition H2O is constructed of Nubuck cowhide with Superfabric and a Hydratex finish for waterproofing. The Dynamic Support Frame (DSF) gives a strong pivot point at the medeoli before wrapping around and up the back of the leg externally. This is going to provide a great amount of protection from hyperextension, crushing impact, and torsional injury. The heel cup and toe box are also heavily reinforced. The large external shin plate protects against tibia injury while the Seesoft-backed tongue area adds protection underneath. The sole is reinforced with a shank and polypropylene layer which provides extra durability, torsional resistance, and comfort while standing for long periods of time. 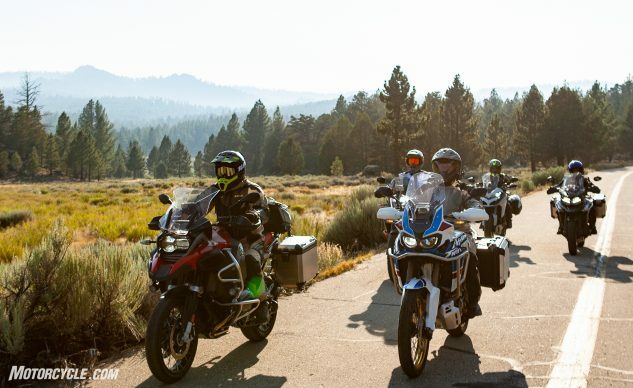 The adventure-specific Vibram sole was designed to give the optimum traction of a hiking boot while still considering the needs of motorcyclists to work the controls. The BOA closure system is a nice lightweight option that uses aircraft-grade stainless steel laces routed in a way to ensure a nice snug fit when ratcheted down using the BOA knob. Inside, the silver-ion antibacterial 3D liner should allow the foot to breathe without allowing bacteria to grow. The Expedition H2O is also available in black and a black/brown version. If you want the ultimate in protection from an adventure boot while keeping the comfort of a touring boot, maybe the Expedition H2O is the boot for you. The Sidi Adventure 2 Gore-Tex boot does a good job toeing the line of adventure and touring with welcomed protection, comfort, and weatherproofing. Microfiber is used for the upper due to its advantages when compared to leather. It’s lighter, has higher tensile strength, excellent tear resistance, and won’t fade or succumb to age as leather can when not taken care of. The heel and sides are wrapped in plastic which not only provides abrasion and impact protection but also connects to the pivot point at the ankle. This pivot connects to a brace-like system that wraps around the back of the calf. The toe is also reinforced and there is a large TPU shin guard up front. 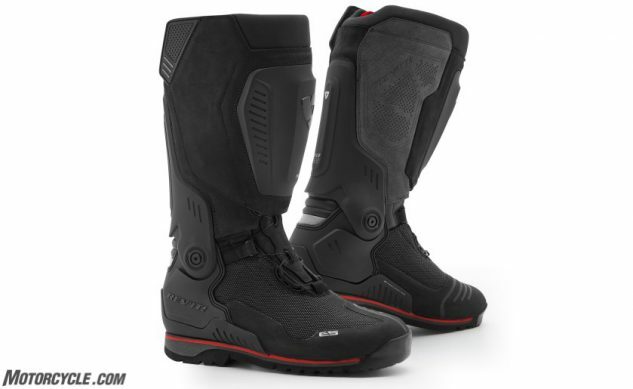 The large Velcro closure panel allows adjustment for larger legs and the two ratcheting buckles used are the same design found on Sidi’s off-road racing boots. The Gore-Tex liner is one of the tallest on the market and comes up about three inches shy of the top collar of the boot. The lugged sole provides excellent traction in muddy conditions and is reinforced for comfort and protection. Check out Ryan Adams’ full review of the Sidi Adventure 2 for more info. The TCX Baja Gore-Tex is the Italian company’s top-of-the-line adventure boot, backed with Gore-Tex and built to tackle whatever lies ahead. Full grain leather and suede panels make up the outer construction of the Baja while the entire boot is backed by Gore-Tex for waterproofing. The footbed is anatomically designed and can be swapped out for your favorite insole. Three buckles and Velcro keep the boot securely fastened. A large plastic shin panel is used while PU ankle, heel cup, and toe box reinforcement also add protection. 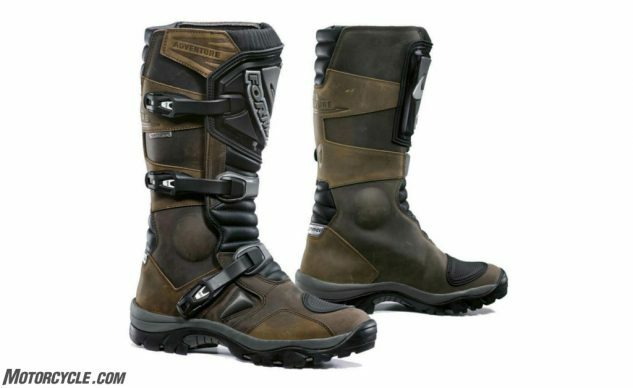 Evans Brasfield wore these boots on Motorcycle.com’s most recent adventure shootout and put together a full review of his thoughts on the Baja Gore-Tex. Check out what he had to say here.